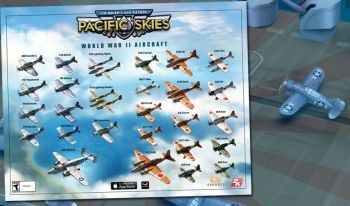 We're Giving Away Signed Sid Meier's Ace Patrol: Pacific Skies Posters! Don't forget to sign up for a chance to win a signed Ace Patrol: Pacific Skies poster! It's not too late, folks. There's still time! It's already been over an hour since we started taking entries for latest giveaway, but it's cool. We'll wait. We're giving away a couple of Sid Meier's Ace Patrol: Pacific Skies posters autographed by the man himself! We know how much you guys love Sid's work, so we figured you would be tripping over yourselves to sign up for a chance like this. Don't worry, you actually plenty of time: We're accepting entries through December 1. Eligible participants will be at least 18 years of age. We have two of these beauties: Anybody can win the first one, but we're saving the second for our Escapist Publisher's Club members. You saw the poster, right? Why are you still reading this? Click here and sign up already! If you want to know more about Sid Meier's Ace Patrol: Pacific Skies, you should check out the game on Twitter and Facebook.